Do you want to build your podcast audience? Then get a pen and paper out because we have a jam-packed episode of Should I Start a Podcast for you. This week, it’s all about the power of influencers, with a master of influencer marketing, Nathan Chan. Nathan is the CEO of Foundr, a digital magazine that’s interviewed industry leaders including Richard Branson, Arianna Huffington, Gary Vaynerchuk and Tony Robbins. Nathan has built his magazine from the ground-up in just three years, and has also grown his business Instagram account from zero to 400,000 followers in only 12 months. Here, Nathan walks me through his 9 step process for connecting to and getting influencers on your podcast. He shares the lengths he went to in getting Richard Branson on the cover, and why never taking no for an answer is the best approach you can adopt. 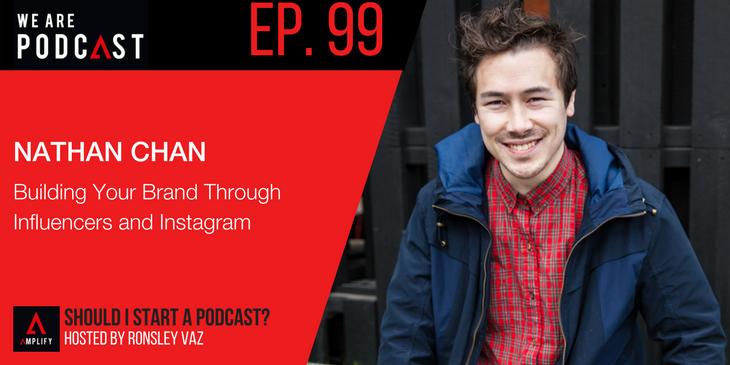 If that wasn’t enough, Nathan also shares his highly sought-after tips on how to build an Instagram from nothing to the top of the influencer list. Ronsley is the founder & chief day dreamer at AMPLIFY. He is an author, speaker & serial entrepreneur. He has a Masters’ degree in Software Engineering and an MBA in Psychology and Leadership. He is known as the creator of We Are Podcast – the first Podcasting Conference in the Southern Hemisphere, and the host of The Bond Appetit Podcast and Should I Start a Podcast. He has an audience of over 3 million in 133 countries.